Voting is a foundational right and responsibility of citizens in all democratic nations. Yet voter turnout in the US has been around 40% in midterm elections and 60% in presidential elections. That is, at least four and up to six out of ten eligible voters refrain from going to the polls. This phenomenon is not specific to the US – economically developed democracies where fewer than 70% went to the polls in recent elections include France, Canada, Ireland, Spain, and the UK (Pew Research 2018). Political scientists have shown conclusively that voting participation, at least in the US, is strongly correlated with income (e.g. Verba et al. 1995). Richer people vote more. This form of social inequality is troubling on a number of levels. In practical terms, this pattern appears to have distortionary downstream effects on representative government – reinforcing patterns that bias public policy towards the wealthy (Schlozman et al. 2012, Griffin and Newman 2005, Gilens 2012, Bartels 2009). Indeed, the most compelling empirical research on this topic tends to show that who participates affects who gets elected and the policies they implement (Fowler 2013, Griffin and Newman 2005, Leighley and Nagler 2013, Madestam et al. 2013). Is the income gradient in voter turnout due to a causal link between financial resources and civic participation? Or does income correlate with another characteristic, such as household interest in politics, that is the true driving factor behind the observed correlation? In the absence of a random shock to income that does not affect other household preferences, these two alternatives are hard to disentangle. In our recent paper, we show that that children who grow up in households that experienced a positive external shock to unearned income due to a quasi-experimental government cash transfer are more likely to vote as adults, even if their parents did not vote (Akee et al. 2018). Consistent with theory that predicts a diminishing effect of extra income on civic participation as incomes grow, this finding holds only for children from households that were in the bottom half of the income distribution before the unconditional transfers began. The income transfers were generated from newly opened gaming operations on an American Indian reservation and were distributed to all tribally enrolled members regardless of initial income. We used panel data on tribally enrolled members, their children, and non-American Indians residing in the surrounding counties (who were not affected by the transfers) over two decades, linked to the voter registration rolls. The average income transfer per eligible household while the children were still minors was around $4,700 per year. The average annual pre-transfer household income in the sample was around $27,000. Examining the voting patterns of parents and children from the same household, we find evidence of strong correlations between the two. Poorer parents are less likely to vote, and so are their children. The surprising finding is that this relationship between parents’ and children’s voting behaviours is disrupted if household incomes increase during the child’s adolescent years. We find that the children from the bottom half of the initial income distribution increase their voting by 10 to 20 percentage points as adults compared to their counterparts who did not receive the increased incomes during adolescence. In Figure 1, we show how the income transfers affect voting behaviour among children from households initially below and above the median income. In related analysis, we show that the strength of the relationship between parental and children’s voting probability diminishes once the additional household income is considered. One very likely interpretation is that the increase in household incomes disrupts the intergenerational transmission of voting behaviour, at least among those who are initially least likely to vote. We also test whether the parents change their own voting behaviour in response to the increased household incomes. We find no such effects. 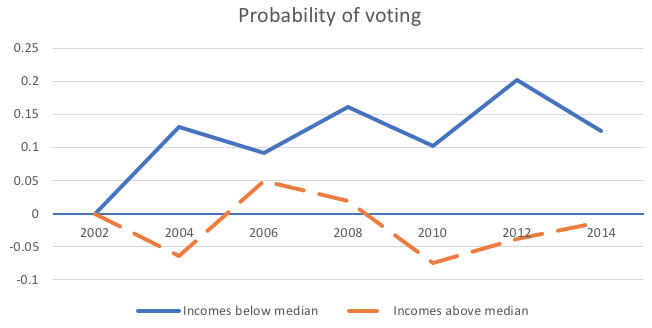 In Figure 2, we plot the differences in voting probability for the parents over the period before the transfers started (prior to 1996) and the time after that, separating the observations depending on whether they experienced the increased income or not. As the figure demonstrates, there is no systematic impact on parental voting across these two groups. We conclude from this that household income during the adolescent years may affect children’s probability of voting later in life, but has no effect on adults. This suggests that propensity to vote may be set relatively early in life. Therefore, interventions during adulthood, such as information campaigns and additional income, may have little immediate impact on voter turnout. Note: All estimates are relative to the year 1996. How does additional income work to improve future voting participation among children? There is relatively little modern empirical research on these issues, and the mechanisms that bring the effects we describe about are not well understood. We put forth several hypotheses that may explain the findings. First, we show that families that received the unconditional transfers were less likely to move. The additional income may improve a child’s social capital by increasing the likelihood that the family remains in one location for long enough that the child can form and maintain meaningful social connections. Subsequently, children may see a larger potential benefit to civic participation in a community that they care about. Second, we find that the children from the initially poorer households who received the income transfers are also more likely to have completed more education. Both of these channels – an increase in social capital and in human capital – would result in an increase in voting probabilities. Many efforts have been made to increase voter participation among disadvantaged low socioeconomic status families in the US. Special programmes provide citizens with various information or social nudges. Sadly, most of these interventions have negligible effects on disadvantaged populations or have even backfired and made participatory gaps worse. Our results suggest that efforts to reduce income inequality, in itself a large and growing burden on modern day democracies, may have an unexpected side effect in reducing gaps in civic participation. Interestingly, it appears that one way to encourage policies that would narrow income gaps in the future is to lift children out of poverty now. Akee, R, W Copeland, E J Costello, J B Holbein and E Simeonova (2018), “Family Income and the Intergenerational Transmission of Voting Behavior: Evidence from an Income Intervention”, NBER Working Paper No. 24770. Bartels, L M (2009), Unequal democracy: The political economy of the new gilded age, Princeton University Press. Desilver, D (2018) “U.S. trails most developed countries in voter turnout”, Pew Research Center, 21 May. Fowler, A (2013), "Electoral and Policy Consequences of Voter Turnout: Evidence from Compulsory Voting in Australia", Quarterly Journal of Political Science 8(2): 159-182. Gilens, M (2012), Affluence and influence: Economic inequality and political power in America. Princeton University Press. Griffin, J D and B Newman (2005), "Are voters better represented? ", The Journal of Politics 67(4): 1206-1227. Leighley, J E and J Nagler (2013), Who votes now? : Demographics, issues, inequality, and turnout in the United States, Princeton University Press. Madestam, A, D Shoag, S Veuger, and D Yanagizawa-Drott (2013), "Do Political Protests Matter? Evidence from the Tea Party Movement", The Quarterly Journal of Economics 128(4): 1633-1685. Schlozman, K L, S Verba, and H E Brady (2012), The Unheavenly chorus: Unequal Political Voice and the Broken Promise of American Democracy, Princeton University Press. Verba, S, K L Schlozman, and H E Brady (1995), Voice and equality: Civic voluntarism in American politics, Harvard University Press. Verba, S, and N H Nie (1987), Participation in America: Political democracy and social equality, University of Chicago Press.